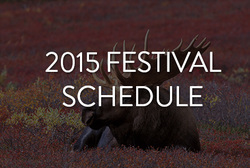 Summit Programming - Jackson Wild: Nature. Media. Impact. Overview: Where Do We Stand? A look at recent data gives surprising insight into the complicated picture surrounding elephant conservation. From Vulcan’s Great Elephant Census, to DNA analysis of confiscated ivory, and surveys tracking a shift in consumer attitudes, this session is offers a comprehensive overview of current trends associated with ivory poaching, trafficking and demand. Ivory is only one of the high stakes commodities in play as profits generated by illegal trafficking in drugs, arms, animals and humans fund organized crime syndicates, terrorism and global destabilization. The opportunity for us to make the greatest impact in elephant conservation is by linking arms and working together around specific ideas. This will be the first of three crucial sessions at the summit designed to lay the groundwork and frame out collaborations with the potential to amplify our individual efforts. The session will focus on addressing supply and trafficking in ivory and elephant products. Bring your ideas to the table and brainstorm strategies that have the potential to move the needle on elephant conservation. Table Moderators will facilitate brainstorming followed by full group discussion of the ideas that emerge. We’ve come a long way in educating both consumers and government leaders, but there’s a massive amount yet to be done. A look at what seems to be working, and what is on the horizon. With poaching based largely in remote conflict areas and lawless frontiers, anti-poaching efforts have taken on a militarized approach, incorporating specialized ranger training and latest tech innovations to confront an increasingly sophisticated enemy. Can advances in computer technology, communications, DNA tracking, imaging and other cutting-edge innovations provide answers to saving species? Here are some of the most promising possibilities that may change the face of conservation in the field. Networking, with a splash of Teton inspiration. Conservation—and conversation—to match the landscape! Make a point to head outside to watch tonight’s full lunar eclipse. We know that human settlement and land-use has led to habitat depletion and the fragmentation of ancient elephant migratory routes, reading to an increase in human-elephant contact and conflict. This session examines strategies underway in both Africa and Asia, with a special focus on innovative new approaches for dealing with the underlying issues: from poverty and war to agriculture and resource extraction. 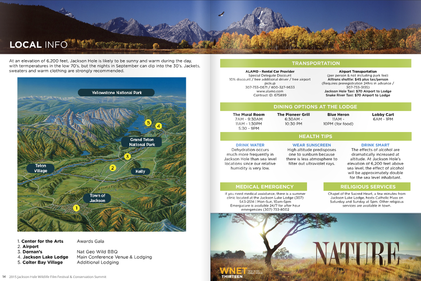 Engage, empower and stabilize local communities, and stewardship of the wildlife and wilderness will follow. A look at some successful programs and initiatives that promote wildlife and humans to coexist and encourage local stewardship of the land and resources. 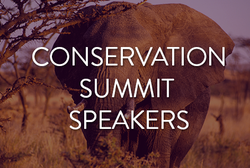 Focused on addressing demand for ivory and elephant products, this is the second of three can’t miss sessions during the summit designed to lay the groundwork and frame out collaborations that ensure we maximize our impact. 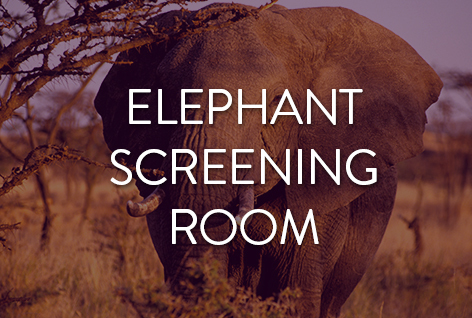 Bring your ideas to the table and moderators will lead a discussion designed to brainstorm strategies that have the potential to move the needle on elephant conservation. Table Moderators will facilitate brainstorming followed by full group discussion of the ideas that emerge. Conservation will only prevail if tangible and sustainable benefits are realized by the broader community beyond the ecotourism sector. From public/private partnerships to scientific research and community development, here are approaches that might be transferrable. Some of the innovative approaches, success stories, challenges and lessons learned from those at the forefront of nature and conservation. Presenters have 8 minutes to share compelling new stories, discoveries, and big ideas that the world needs to hear. Conservation Detection Dogs are key players in stopping Ivory trafficking and the illegal wildlife trade. Pepin, a 9-year old Belgian Malinois and one of the world's most experienced conservation dogs, will demonstrate ivory detection. He will be handled by Working Dogs for Conservation Founder and Director of Research, Dr. Megan Parker. WD4C's Executive Director, Dr. Pete Coppolillo, will also be on hand to answer questions and explain the process and how dogs like Pepin are changing the world of conservation. Ironically, every dead elephant with its ivory intact is a reason to celebrate. It means an elephant died of natural causes, not bullets, snares or poison, and that soul was allowed to be celebrated and mourned by its herd. 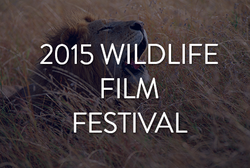 Award-winning filmmakers, Dereck and Beverly Joubert start with the remains of two bull elephants and through a series of key flashbacks, look at the lives they would have led, the dramas they may have seen, their great migrations for water with their families, and their encounters with lions and hyenas. This film, shot over two years, is an intimate look at elephants through the lens of two great visual storytellers of the natural history genre. It doesn’t matter if you are revealing the wonder of science, advocating for wildlife conservation or weaving a cinematic dream – nuances in how you tell the story can transform its impact on your audience. Dan Kahan heads Yale’s Evidence-Based Science Communications Initiative, and his data have riveted the attention of science media purveyors of all genres. TRENDING…From Short-shorts to New Chip! What’s the latest hot programming trend, and what has already lost its steam? From the proliferation of short-form to the reinvigorated blue-chip program, personal narrative and the ubiquitous “character-driven” program, Industry visionaries discuss where they see the market heading, and how to stay at the front end of the latest programming wave. A showcase of some of the pachyderm projects in the current production pipeline, with discussion about stories still needing to be told. Author and biologist Carl Safina interviews this year’s Outstanding Achievement Award-winners for an hour of scientific revelation and a lifetime of insight from two of the world’s foremost elephant experts and ardent advocates. While numbers of downloads, eyeballs on screens and bodies in seats measure reach, they fail to capture the information we really want: what difference did you make? Media that matters is media that catalyzes action. This session examines what it takes to leverage media into on-the-ground impact with a look at how that can be quantified. Some of the innovative approaches, success stories, challenges and lessons learned from those at the forefront of science, technology and conservation. Presenters have 8 minutes to share compelling new stories, discoveries, and big ideas that the world needs to hear. VR might be a great new toy to play with, but how do you pay for it, let alone make a profit? And what do future business models look like? Hear how producers are covering their budgets, and how some early adapters are already embracing this bold new world. Whether you’re a scientist keen on public outreach, a small NGO considering a foray into video advocacy, or an international NGO with big communication goals, creative short films can help you reach your audience. In this workshop, we’ll help scientists, NGOs, and independent media producers tackle that all-important question – how do you work together to get the message out? Prepare to be inspired by an unforgettable evening of insight, humor and common sense. M. Sanjayan interviews E.O. Wilson, the most revered biologist of our age. From high tech drones and GPS enabled aerial surveillance to conservation dogs on the ground, cutting edge anti-poaching techniques will be explored along with tried and true grass roots efforts on the ground, including anti- poaching patrols, and Para-military efforts and citizen engagement. A special focus will be given to innovative projects empowering local communities through positive media messaging and viable incentives and alternatives to enhance the quality of life and economic sustainability and promote resource stewardship and conservation. Demand for ivory products is driven largely by the Asian consumer market and a long-standing perception that ivory is a symbol of prestige and wisdom. The USA is second only to China in the importation of ivory products for sale in the form of figurines and jewelry. A recent step has been taken by the Chinese government, in pledging to end the ivory trade through enforced legislation and laws regarding the purchase of ivory products, while the USA continues looking at closing the loopholes and curbing the ivory importation. Authorities from the field share their expertise as we look at options and solutions in the worldwide market, to curb the demand for blood ivory. Examining the international laws, boycotts and legislation, speakers and panel discussions will connect the thread of the trade – from range to port to buyer – through activation of local communities, continuing education and pressure on governmental bodies, and through the utilization of positive media messaging created with respect to the local communities and countries in question, in order to get the most positive results. Fresh and new ideas will be presented by emerging leaders from a variety of disciplines (including conservation, media, education, government, business/innovation, community engagement) as we explore ways to empower local communities to implement local solutions. 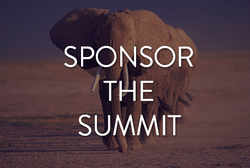 Other important issues to be discussed throughout the Summit include the human/elephant interface, shrinking habitat and migration corridors, new science, stories of hope and innovation, and the essential role media can play in the fight to save the world’s last remaining elephants.